The EU uses the European Structural and Investment Funds (ESI) to support the development of its regions. The new support period has been running since 2014; new aims, strategies and support programmes have come into force. These subsidies offer a great potential for art and culture and at the same time, art and culture contribute considerably to the regional policy aims: to the attractiveness, quality of life and competitiveness, as well as to social cohesion. The österreichischen kulturdokumentation Der Kreativ-Motor für regionale Entwicklung [The Creative Motor for Regional Development] has already shown this for the previous support period. A good reason to take the next step and produce a practical guide to make the regional support funds more easily accessible for art and culture. The guide At a Glance. 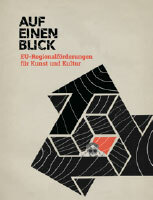 EU Regional Supports for Art and Culture. offers concrete and practical support for Austrian artists, cultural workers and institutions - EU beginners and professionals. It presents profiles of all current programs in Austria, gives pointers to project development and applications and answers all the questions on the issue: What are the European Structural Investment Funds? How do ESI supports work? What programmes are there? What projects are supported? Under what conditions are art and culture supported? How do applications, implementation and accounting work? Where is advice available? All the important terminology on EU regional policy and the important information is summarised in the glossary.